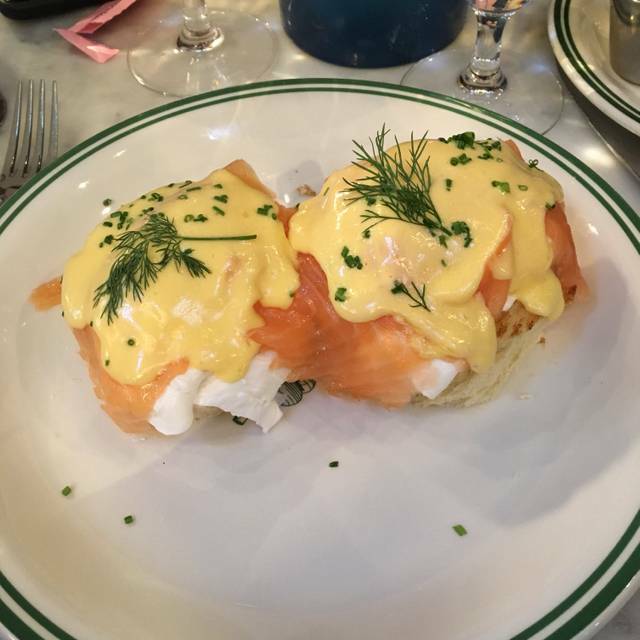 Sadelle's is a NY Brasserie with an emphasis on fish, freshly baked bread and classic dishes. It also specializes in traditional Russian caviar and vodka service. Sadelle's is located in a very unique loft space in the heart of SoHo. Every night it transforms from a bakery into a fantastical restaurant that is illuminated solely by candlelight. Everything was OK, except the eggs for Eggs Benedict was really overcooked ! Service was good also nice decoration inside! Bagels are just been cooked in the center! Too many tables in a reduced space. Service is pretty bad for New York standards. Food is good. Nothing amazing. Bagels are very good, so are spreads, fish and French toast. Menu could use some work. The waiter was not polite. Food was great, but too expensive and not wipers it. The host seated another couple right next to us where the whole restaurant is empty on Monday morning at 8.30 am. We are so close that I have to hear another person talk about inappropriate conversation. I loved Sadelle's! Having seen the infamous tower all over instagram I wanted to try for myself! 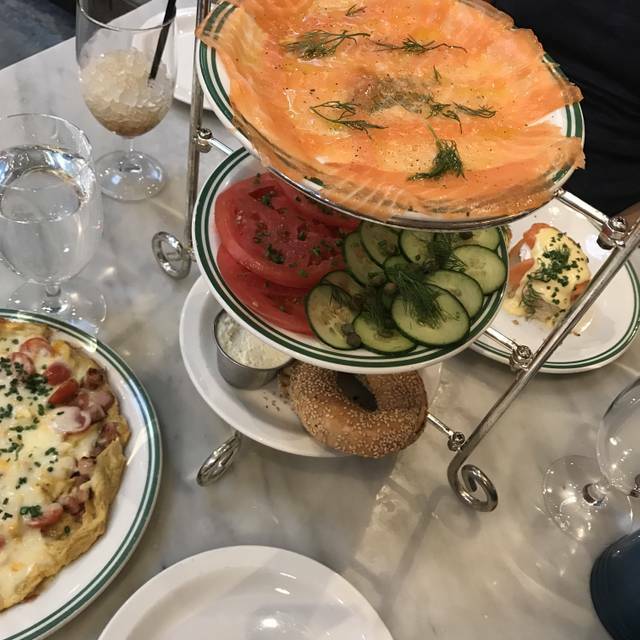 Tip: if you like lox and are sharing, I would order two plates of lox because for two bagels it was a bit skimpy. But overall great experience! If you want a good picture I would recommend asking for a table in the front and not all the way in the back. I got them to sign the contract! The lox put them into hypnosis! 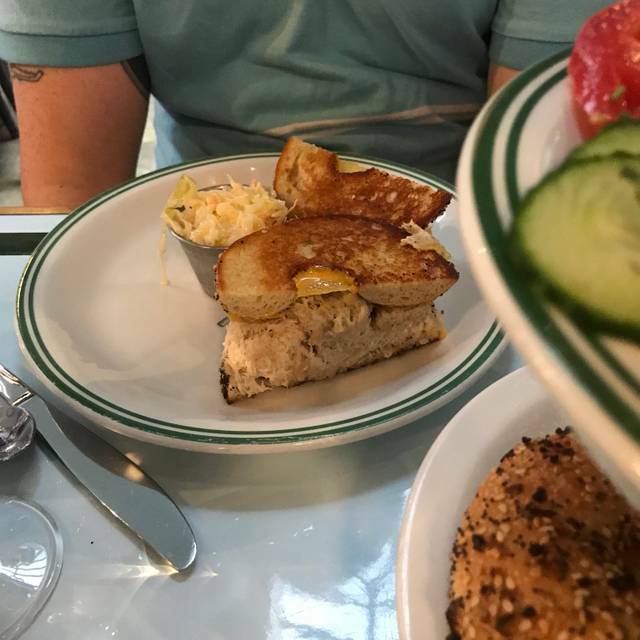 Extremely disappointed in my brunch at Sadelle’s. Was so happy to make a reservation and go with my cousin to Sadelle’s. I’ve been many times and always love the food and the service. This time, we sit down on a cold rainy day and order hot coffee. The waiter tells us that the coffee machine is broken. Which I understand occurs and is fine. But we noticed cups on all the other tables. He said try the iced coffee so we decided to and asked to have hot once it was working. We then got a half a cup of iced coffee and as were being served It the table next to us is being served hot coffee. The other waiter said that the machine has been working on and off. By the time we saw our waiter again our food was already served. We then get the bill and each iced coffee was $8.00. Completely absurd to charge us $16.00 for 2 iced coffees that we just were waiting to have until we could have hot coffee. And we weren’t even served a full glass of It. If we had ordered iced coffee then I would agree and understand but we couldn’t order what we wanted and therefore our coffee should of been the price of hot. Extremely disappointed in the service that took place. 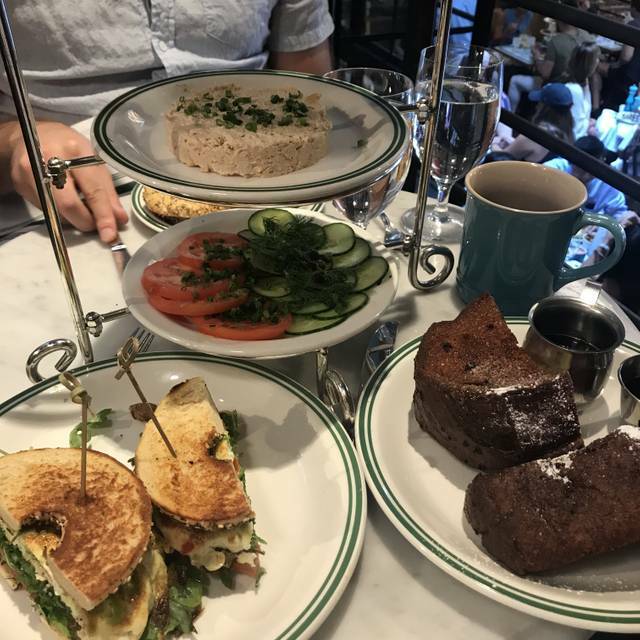 Sadelle’s has always been my favorite as I celebrated many birthdays and special occasions eating there And now I’m not sure I will return. I keep coming back for the house salmon tower. It is perfect for brunch. My guest had the Cobb salad. It was great and enough for three people. $24 for a bagel with the tiniest amount of salmon. Have been before and portions were better. Was still hungry. Everything was great, just wish there was more room in between tables for privacy. It’s hard to get comfortable and enjoy your food when your so close to others. Great bagels and house salmon. Our server was fantastic! 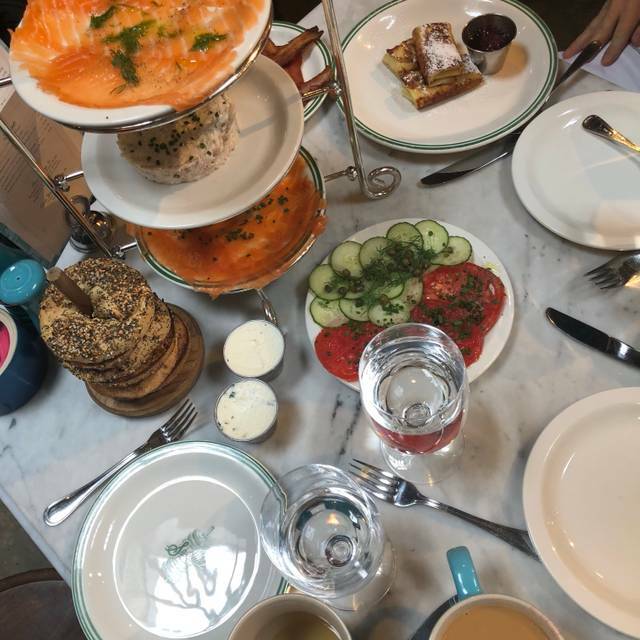 Vibrant scene of rich kids in designer clothes talking about Coachella and families eating exceptional fresh-sliced smoked salmon platters, homemade bagels (you can watch them made the middle of the dining room), omelettes, and other pastries. Service is consistently inconsistent. Reservations must be made well in advance for peak brunch time. Ambiance was great. Because we had a reservation, we were quickly shown to our table whic was lovely. A little pricey for what you get. Salmon is amazing and presentation of food was fun! Tea was lukewarm despite requesting a new cup of tea because the first one was cold. Overall great experience and I would go again. It was good but disappointing in terms of value for money. Best salmon I had. Delicious bagels and cream cheese. Food is great however there seems to be an issue with the maître’d and co. We were a party of 2 with a reservation at 9am. One of us arrived later and despite the restaurant being only half full, the first guest wasn’t able to be seated “until the whole party arrived”. Ridiculous. 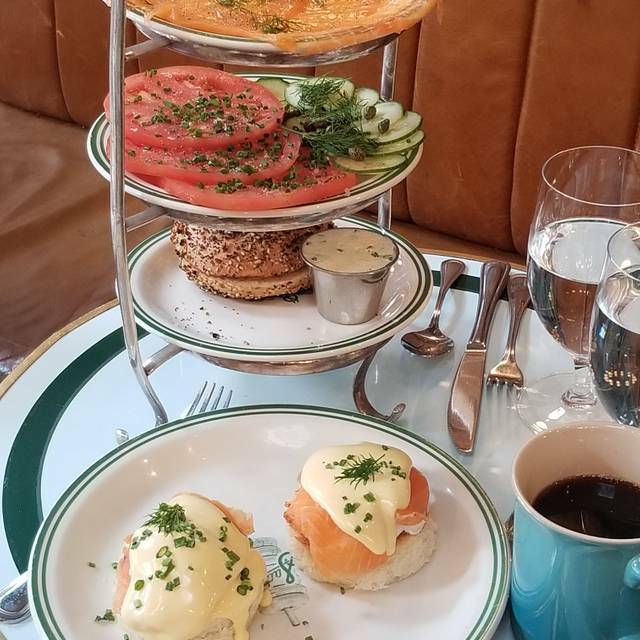 The food while great was wholly overpriced - a bagel and filter coffee was essentially $45 per person. Head to Russ and daughters for better bagels and better value. Although there is a huge hype about this place, and the food was quite good, our brunch started with a very rude hostess shoving us in probably the worst table in the place. Luckily our waiter was very kind and we didn't feel like we didn't belong there. Coffee options are coffee, decaf and iced. Literally, the worst cup of coffee I have ever had. Bitter sludge. Bagel and house salmon, and the salmon eggs benedict were good, and then a manager came by to ask us if we wanted to share a sticky bun. I had heard that these were great, so we said yes. Worst part of this place was the crappy coffee was $6 and the crappy iced coffee was $8 and the tiny sticky bun that we really did not need to have was another $6. Paying almost $100 for breakfast just doesn't do it for me. 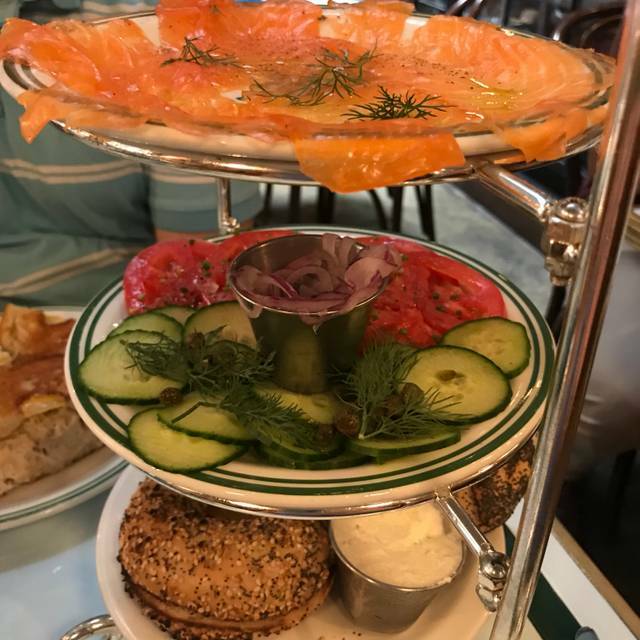 Delicious smoked/cured fish and bagels. The salmon was sliced to perfection. We practically had the place to ourselves on a Friday night at 6, so I'm sure brunch is more crowded and noisy. Our servers could not have been nicer and more attentive. The babka and sticky bun were not good. The French toast was insane! The menu was an abundant selection of delicious items. I chose the Soft Scrambled Eggs with Baeri Royal Caviar and my colleague the Lobster Benedict with French Trout Roe. The food was delectable however very watery from steam or condensation. Not runny as soft scrambled eggs should be. The lobster benedict was divine. Thanks to our amazing server, Laurel for taking sure great care of us. Service was slow and inattentive this time. Usually it’s been great! I found the comfort level very poor. Tables too small. We are from Montreal. Known for great breakfast establishments. When charging $6 for a cup of coffee it should be outstanding and yours was awful. Should use better quality. A good French or Italian dark roast coffee. Yours had a taste from Latin America which I find inferior. My wife felt the same. She prefers Expressos which you don’t serve. Going to be hard to recommend your establishment to friends unless you guys had a bad day. Coffee as you know is the first thing you order and test so first impressions are important. Great location, came because of Paul Hollywood. Not disappointed. Only thing I was unaware of was that they only do direct cash amount. 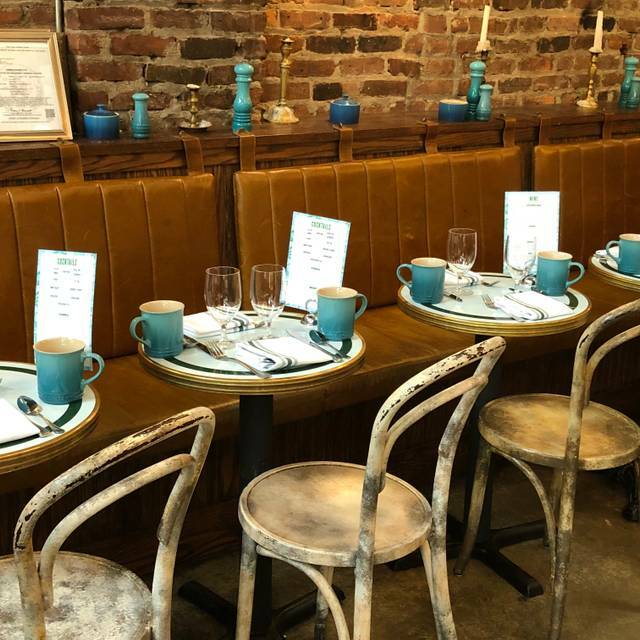 Best place for brunch in NYC. Excellent food and cool place! The restaurant could be so much yet disappointed us. It was impressive to see the lox being carved so beautifully on entering the restaurant and the hosts were very professional and kind. We were taken to our table and were disappointed on how close the tables are to one another. There is no feeling of privacy and sitting on the outside of a table meant getting bumped by serving staff as they passed. The nova lox presentation on a tiered stand was quite impressive yet damaged by having one bagel included. This is ridiculous! 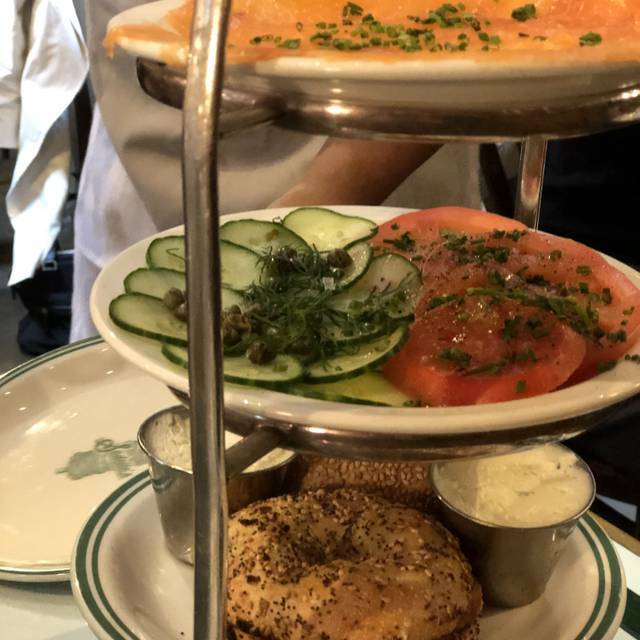 Lox and the tiered tray is very expensive and the restaurant makes great efforts to show off how they bake their own bagels but one bagel is just not enough. The pigs in blankets were excellent. The sticky bun was purported to be incredible but it was tiny, cold and got lost on the plate. We had two waiters, one excellent and the other amateur with a wrinkled, dirty coat that was not becoming. All in all, we had a nice brunch but because of some of the above, we would be in no hurry to return. We stopped by NewYork for 2 days. I planned every minute. Sadelle’s was good. It would even better if we had more space. Our experience was ilke eat and go because of the limited space on the service way. Nothing special. A menu which focuses on sandwiches and bagels. Mostly underwhelming and simple food that has nothing which stands out. Each time we go to NYC we always reserve a table!! Hopefully with our favorite waiter, Maxwell. The food is outstanding, it’s a must for brunch!!! Hello from Montreal where we have the best food and so does Sadelle’s!!! Love Sadelle’s. Food and ambience were wonderful. The only disappointing thing were the toilets. There are only two and they needed a good clean.